Do you want to teach me life & communication skill I am Andrei and I see at myself as I am a multi-function person. Love to SWIMMING, Hiking, Badminton, Yoga exercises. Pride of Two University qualifications: Engineer plus Travel Manager. Doing Freelance Service for a living and helping people. So if you Love to Travel, I will be happy to be your personal guide in Russian country, in Belarus... Now --- I am looking for my Lady... Lady who will employ me as her man... Can you introduce me toward Cougar-Lady? 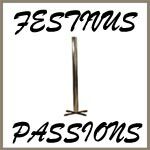 Help us keep Festivus Passions free of spam and fake profiles.